So God created man in His own image, in the image of God He created him; male and female He created them (Genesis 1:27, ESV). Let’s rewind humanity’s story way back to the beginning. “Then God said, ‘Let us make man in our image, after our likeness.’ ... So God created man in His own image, in the image of God He created him; male and female He created them” (Gen. 1:26–27, ESV). My brain doesn’t know what to do with this. I don’t know how to process this mystery. His image displayed in my life. How can that be? How can there be such a compelling connection between God’s heart and my humanity? Especially when I know me. I know that on my best, most holy day, I don’t come close to being imago Dei, the image of God. When I think about what it means to leave God’s imprint on the world, I’m reminded of the signet ring my mother used to wear. When I was a little girl, I loved looking at my mom’s hands. Her fingers were elegant, long, and slender. On her left hand she wore a simple gold wedding band that was eight millimeters thick. No diamond, just the band. And on her right hand, she wore a gold signet ring she got when she was eighteen. I always wanted a wedding ring and a signet ring just like hers. The signet ring had a monogram of her surname: A for Adams, not E for Eisaman (her married name). The ring seemed to be a bridge of sorts that connected who she was to who she is. I loved that. Loved that my mom’s two hands wore two symbols that rep- resented the spectrum of her identity. She grew up an Adams and will always be an Adams. She married an Eisaman and became an Eisaman. Her signet ring left me with an impression that echoed the importance of her identity. • Signet rings were used for a purpose: to authenticate a letter or message. Christ followers are used to bring God glory as we authenticate the hope of Christ to the world. Jesus said, “This is to my Father’s glory, that you bear much fruit, showing yourselves to be my disciples” (John 15:8). • Signet rings were used to leave an imprint, a distinct impression that validated that the message being delivered was genuine. Jesus kicked it up a few notches for His followers by telling us that our love for one another authenticates our faith. He was talking to His disciples when He said, “A new command I give you: Love one another. As I have loved you, so you must love one another. By this everyone will know that you are my disciples, if you love one another” (John 13:34–35). Do you see? You and I are signets for the King of Kings. We are to bear evidence of the message of His hope—no matter what compromising assignment our bosses give us, no matter what carrot of temptation is dangled before us, no matter what argument that person tries to bait us into, no matter what lions’ dens we might be thrown into. We’re called to “always be prepared to give an answer to everyone who asks you to give the reason for the hope that you have. But do this with gentleness and respect, keeping a clear conscience, so that those who speak maliciously against your good behavior in Christ may be ashamed of their slander” (1 Pet. 3:15–16). To fulfill our purpose as image bearers, we need to be an imprint. We also need to “rep the house” well. What does that mean? We’ll cover that in part two. Lord Jesus, Thank You for making me in Your image, for always remembering me and for engraving my name on the palms of Your hands. Would You help me to be Your image bearer today? How was Daniel an image bearer of the one true God in this encounter? 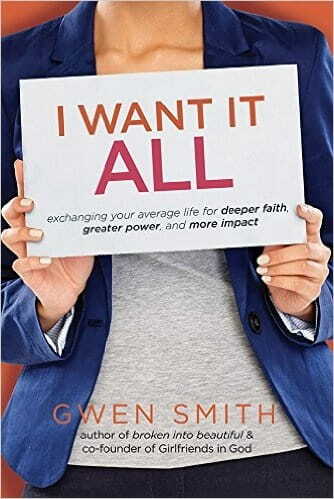 Today’s devotion is an excerpt from the new book by Gwen Smith, I Want It ALL. This book is filled with practical help and Biblical depth. Order yours today from Amazon, Barnes & Noble, ChristianBook.com or your favorite retailer.